The University of Maryland’s graduate architecture program starts off with the Integrated Design Studio. Students often work on the same building for the entire semester, and they meet with mechanical and structural engineers as well as their studio critic. Materials and construction methods must be understood, and included in the design of the building. This is an intensive, immersive course, with a co-requisite of the structures course. It also comes with a significant recommended reading list, that includes reference materials, precedent studies, certain architects monographs and current articles on newest building technologies. Approximately six years ago, the previous architecture librarian and the professor of the studio tried an experiment. What if the books for this specific course were placed in the studio to be available for the students the entire semester? Most architecture firms have working libraries as an integral part of their office. This would be another way to mimic the professional experience. 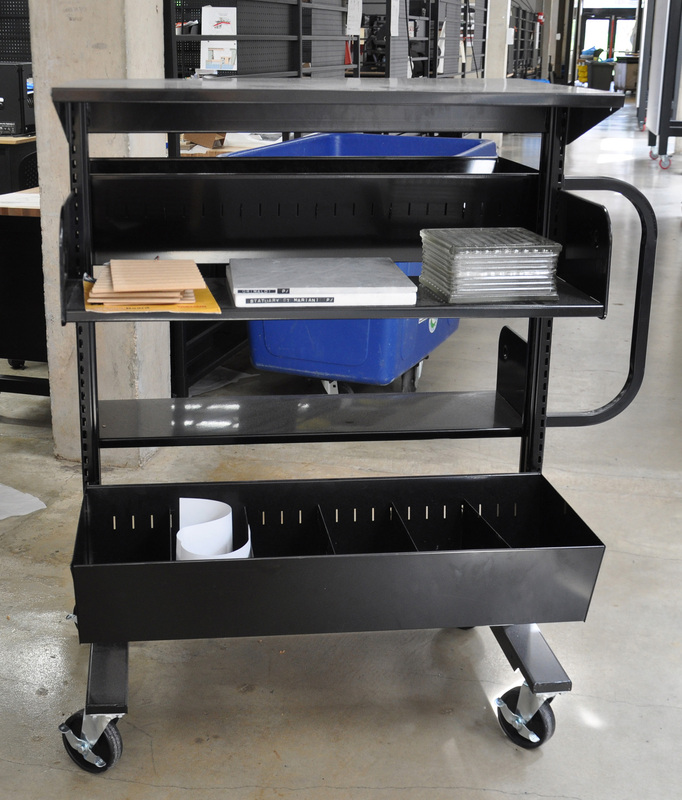 In this case, the library is somewhat portable – a double-sided bookshelf on wheels, known as a kiosk, became the shelving system of choice for the studio. They are 49 inches tall, 25 inches wide, and 39 inches long with 3 shelves on each side. My predecessor did the hard part, getting permission to send books out of the library, and getting the metadata staff to add categories to ALEPH – our catalog and circulation system. Then she ordered and assembled the kiosks. The books are treated like any other set of books put on reserve for a class, but instead of residing on a shelf in the library, they reside on a kiosk in the studio area. The professor submits a list of books through the course reserves module of Canvas, our Enterprise Learning Management System. The Libraries use a system called ARES to manage course reserves. Within ARES, we can look up a book, get its call number, determine which library it is in, and print slips with the call number and course number on them. My student workers take the stack of slips and pull the books from the shelves in the architecture library. I order any new books, and recall books that reside in other libraries on campus. To put the books on reserve for the studio course, the collection is changed and the item status is changed. The collection is temporarily changed from general collection to SKISK, where SKISK means studio kiosk. This location code had to be added to the Library catalog and circulation system. The item status goes from regular to non-circulating. With these two changes, if the book ends up in the book drop or found somewhere, and we scan its barcode, it is immediately identified as a studio kiosk book, and gets placed back on the kiosk. We also place a ‘course reserves’ sticker on the spine of all course reserves books, so there is some visual identification, but these stickers tend to fall off over the course of the semester. One the first day of class, the kiosk is rolled downstairs to the studio, and parked in a somewhat central location for the students. The main concern about this system was the security of the books. However, this is a graduate level studio with students who are used to the studio culture. The building itself is locked at 10 PM, and you need to be a student within the School of Architecture, Planning and Preservation programs with a swipe card to gain access. There are always people working in the studio at all hours of the day and night, so if the book goes missing it is because a student is careless, not because a stranger has wandered in and stolen something. We have done this every fall for 6 years now, and have lost 3 books. Students may take the books off the kiosk and put them on their desks, but I have never noticed coffee stains or physical damage to the books. At the end of the semester the books come back to the kiosk, the professor sends it back upstairs to the library and we re-check them all in, and change their location and item status back to their original categories. This is the same process we use for books that are placed on reserve in the library. We also have a wood shop/ fabrication lab person who does a complete sweep of the studio spaces at the end of the semester, after the students have supposedly cleaned up and moved out. He usually finds a few library books, but often those are books that had been checked out individually by students, and not associated with the studio kiosk. Of course, having the books assigned to the studio kiosk outside of the library cuts down on the gate count, if the students are no longer coming in and out of the library to check out the books or to pick them up from a course reserves shelf. It also reduces the loan counts of the individual books. 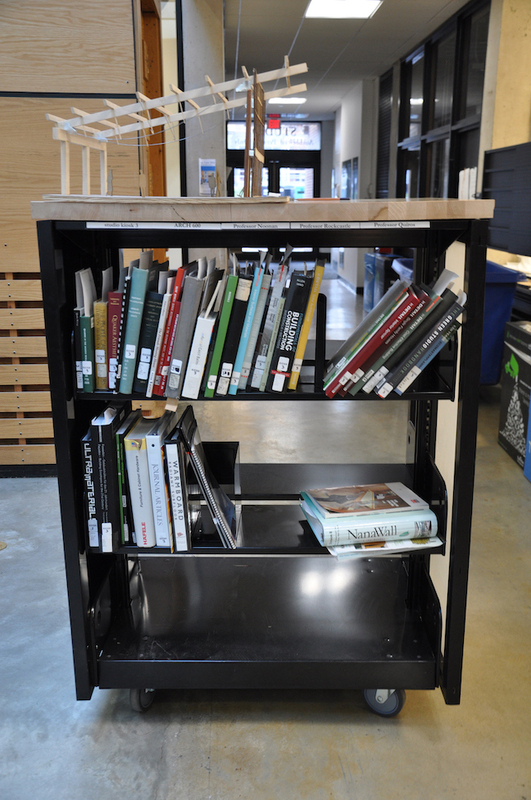 However, the architecture program is the third largest user of course reserve items behind the History and English departments, and I am confident it is because of the numbers of books that go onto the studio kiosk. the materials kiosk shown here. With some bins as well as shelves, the kiosk will hold objects like glass block or tile samples, styrofoam or wood veneer samples. The architecture library is located upstairs from the studios, so it is not a hardship to walk upstairs, but when this project started, the library was not accessible 24/7 by swiping your ID card, like it is now. I walk through the studio occasionally and straighten the shelves on the kiosk. I feel that having the books in the hands of the students makes an impression, and maybe it gets them into the library the next semester to check out books individually. From my librarian point of view, the kiosk has been a successful project, and we will continue to do it as long as the professors continue to see the need.